9.5" Tall Go Kart Racing Trophy. These trophies make the perfect awards for any Go-Kart Racer. This trophy is suitable to award for a corporate team building event or any amateur or professional racer. Each trophy features a go kart racing driver with a black and white checkered flag. 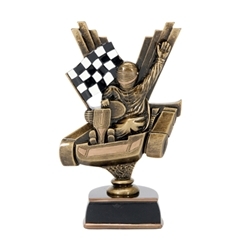 The Go Kart Resin Trophies are sure to be an attention grabber at your next race.